Whether you are celebrating a birthday, promotion, or anniversary, Black Diamond provides private limo services in Denver, Colorado for any occasion. Denver offers so many choices for elegant dining, why not enjoy your evening to the fullest by allowing us to chauffeur you in elegance and style to and from your destination. Our drivers provide prompt and professional limousine services and ensure you arrive at your destination on time, safely, and in luxury. Our drivers are well-trained and all our vehicles are equipped with the latest safety features. Our fleet was built to handle Colorado roads, and can take on winter road conditions with ease. You can be confident that you are well protected as you travel to and from your restaurant of choice. For couples and small groups who want premium customer service in a limousine service, Black Diamond Cars delivers. All our luxury cars offer complimentary Sirius XM radio, Wi-Fi, bottled water, movies and refreshments upon request. 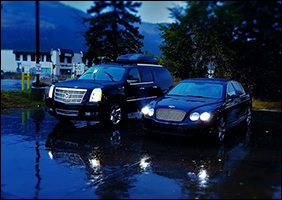 Regardless of time, day, or weather condition, give Black Diamonds Cars a call at (970) 261-6509 to inquire about destinations and rates.